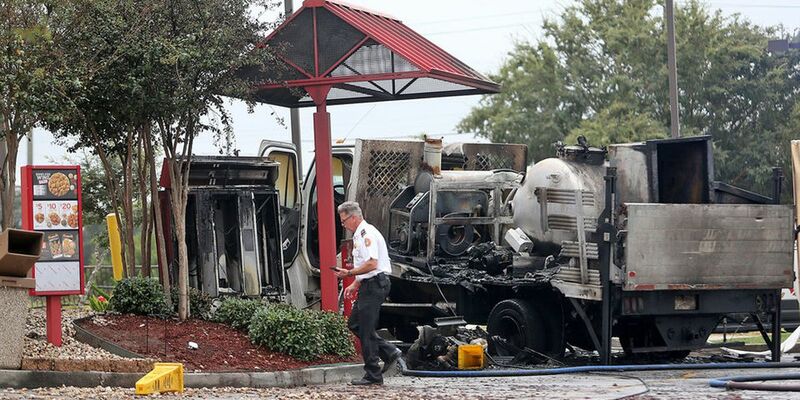 NEW ORLEANS (WVUE) - A man was injured when a truck caught fire in a Popeye’s drive through near the University of New Orleans Wednesday afternoon (Oct. 17), according to the New Orleans Fire Department. The fire was reported just after 12:50 p.m. at 6232 Elysian Fields Avenue. The victim, who was cleaning an oil spill in the parking lot, said gasoline ignited while he was refueling his pressure washer, according to NOFD. The man was brought to the hospital with first-degree burns to both his arms. NOFD officials determined the fire was started unintentionally and“improper fueling technique” contributed to the blaze. “The NOFD would like to remind citizens that vapors from flammable and combustible liquids can ignite, causing a fire. Flammable and combustible liquids should not be used near an open flame or heat source,” NOFD Superintendent Timothy McConnell said in a news release. Seven units responded to the fire, which was under control just before 2 p.m., according to NOFD.